Mount Dan Beard is a wildly mysterious mountain on the north side of the great Ruth Amphitheatre. Its complex bulk is a detached island that is oddly encircled completely by the Ruth Glacier. H. C. Parker and Belmore Brown named the mountain in 1910 after an American painter and illustrator and founder of the Boy Scouts of America, Daniel Carter Beard (1850-1940). Even though it has an easy walk-up route on its back side, it is the south façade that really captures the imagination of climbers. It appears inviting yet appalling in the same glance. Because of this, or perhaps because it is so readily viewed from the popular Mountain House airstrip, this is where most attention is focused. 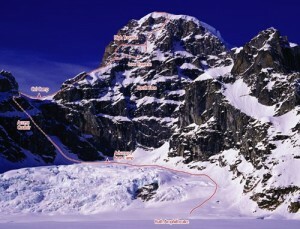 The route opened by Peter Boardman and Roger O’Donovan in May of 1974 is a true mountaineering classic. While not technically difficult, the route requires good judgment and solid alpine skills. Only fast and very competent parties will be able to climb and descend the route in a very long day. The descent especially must not be underestimated as it can take nearly as long as the ascent. Which SuperTopo guidebooks include a topo for Southwest Route?